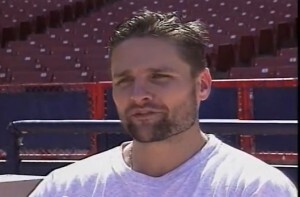 When he first arrived in the Major Leagues, 2nd baseman, Chuck Knoblauch was an astonishingly gifted athlete. To understand the enormity of the tragedy of this man’s baseball career you have to watch these two videos. The question that haunts us is, “What happened between beginning part of Chuck Knbolauch’s career where he was right on the money every time and the later part where he could no longer throw accurately to first? Chuck Knoblauch not only is hurting the New York Yankees with his wild throws, he’s hurting their fans, too. The scatter-armed second baseman made another wild throw Saturday, this one hitting a woman sitting behind the first-base dugout in a game against the Chicago White Sox. I don’t know if Chuck sought the help of a hypnotherapist or NLP Master Practitioner, but this is not an isolated incidence. This “champion” to “chump” process is going on all the time even on the high school and collegiate level. Combine the pressure to perform with public scrutiny and you have a recipe for destroying the delicate balance that makes a gifted athlete great. Talent contributes… but it is mental toughness and the ability to snap back after a mistake or a defeat that determines who will be the champion. The fix in situations like this is not more physical practice. What is required is an understanding of how your mind works and how to change “one time learning events” that are often the root cause of a sudden drop in ability. The difference can be rapid and significant. Why not get the edge that is quietly waiting for you in your unconscious mind?